Laser & photonic reviews published the paper by Ciattoni et al. on the spin orbit coupling in graphene (arXiv version). The coupling of 2D electrons with OAM and Spin allows to control the state of nano-scale light beams, and is potentially useful for multilevel quantum gates. 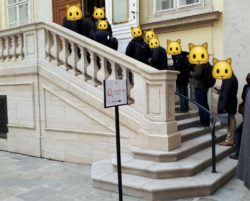 Next Next post: October 29, 2018, Quantum Flagship Kickoff in Vienna! 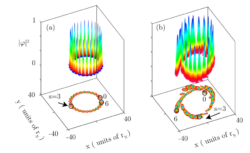 In a paper in arXiv, Mohammed F. Saleh, Claudio Conti and Fabio Biancalana show that the solitonization of the Anderson localization and the formation of optical horizons by cluster of solitons explain the rogue-solitons in supercontinuum generation. This is complex photonics ! The NLO 2019 OSA workshop has been launched. This is the periodical world-famous event on the last developments of nonlinear optics. 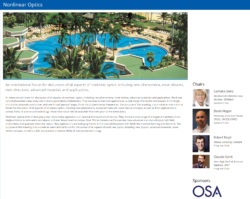 The NLO 2019 edition will be open to new directions as quantum nonlinear optics, machine learning, novel soft- and bio-materials, nanomedicine and imaging applications.